Collectors, dealers and young numismatists can test their coin grading skills by competing in the PCGS Coin Grading Contest at the June 2015 Long Beach Coin, Currency, Stamp & Sports Collectible Show. The collector and the dealer with the highest score will each receive a $1,000 check from Professional Coin Grading Service (www.PCGS.com), and the young numismatist with the highest score will receive a PCGS-certified Morgan silver dollar. "The upcoming PCGS Grading Contest will be an outstanding opportunity for collectors, dealers and young numismatists to demonstrate their grading skills and receive a nice reward if they are able to match the opinion rendered by PCGS," said Michael Sherman, PCGS Director of Collector Education. Adults will have 20 minutes to grade 20 coins, young numismatists will have 20 minutes to grade 10 coins. Participants must register in advance and reserve a time slot to take the test. 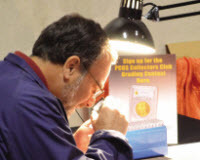 Registration and testing will be held at the PCGS Coin Grading Contest booth, #1127, at the Long Beach Expo and will begin during dealer set up on the afternoon of Wednesday, June 3, 2015, and continue throughout the show from 10:00 am to 6:00 pm Thursday and Friday, June 4 and 5, and 10:00 am to 1:00 pm on Saturday, June 6. "A variety of coins have been carefully selected for the contest, and evaluating each one will definitely challenge even the most knowledgeable collector," said PCGS Co-Founder David Hall. "We've included a few plus grades, some designation dilemmas, and even a counterfeit coin to see who really knows their stuff. We hope the contest will be fun as well as challenging, and we look forward to honoring the winners." The entry fee is $50 for dealers and adult collectors. Entry is free for young numismatists 16 and younger. Employees of PCGS and Collectors Universe are not eligible. Additional information and rules about the contest will be posted on the PCGS website. "Based on previous PCGS Grading Contests, we anticipate the available entry space will fill up quickly. So, I encourage everyone thinking about entering to promptly register so they don't miss out on this exciting way to test their grading skills," said Don Willis, PCGS President. To register or get additional information, call PCGS Customer Service at (800) 447-8848, Monday through Friday between 7:00 am to 5:00 pm PST.